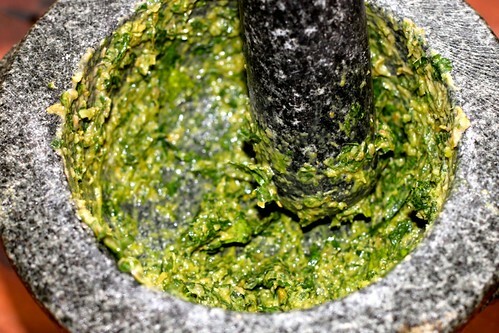 So it’s a fairly significant fact that in this post about salsa verde I am not going to link to the salsa verde in my archives, the one that I made in September 2010 (and that you can easily find by searching in the search box). 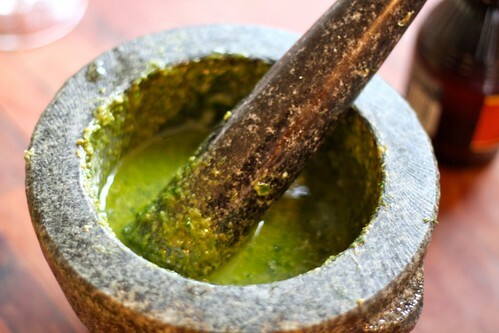 That’s because, now that I’ve made that same recipe in a mortar and pestle, I disavow the old method. 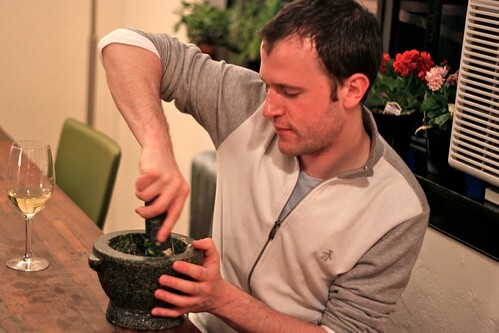 A mortar and pestle is the only way to do it. 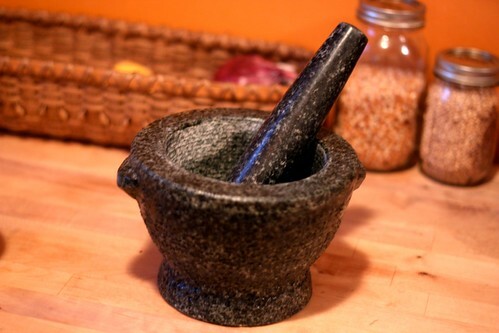 This is an entirely different entity than the puny, wooden mortar and pestle I’d been using from Chinatown. (See this old post on aioli to get what I’m talking about.) Whereas that wooden mortar and pestle could barely crush a chickpea, the Michael Ruhlman mortar and pestle could probably grind up a small animal, it’s so powerful. And that’s precisely what you want in a mortar and pestle. You want the friction to grind up whatever it is you’ve got in there and, in doing so, you achieve a totally unique texture, something you don’t achieve in a food processor or a blender which makes everything homogenous. 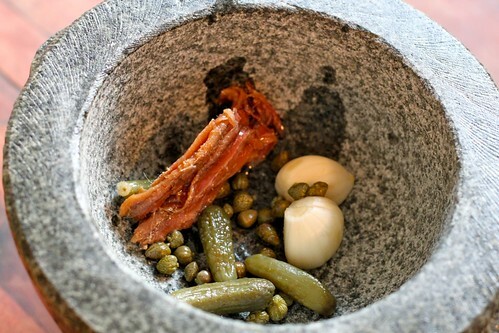 That’s why salsa verde in a mortar and pestle is so much better: the texture is chunkier and far more interesting. Now when I say “salsa verde” I’m not talking about the one from Mexico with tomatillos; I’m talking about the one from Italy with garlic, capers, vinegar and herbs. The one I like to make comes from Jamie Oliver. Now add a spoonful of mustard and a splash of red or white wine vinegar, doesn’t matter. 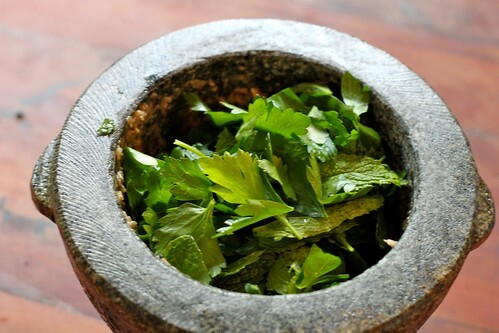 Quickly work that in and then add a big handful of parsley leaves and mint leaves. Taste and adjust for vinegar and salt. As for what to do with it, I’m sure it’d be great on vegetables or fish, but I served it over chicken (something you’ll read about in my next post.) 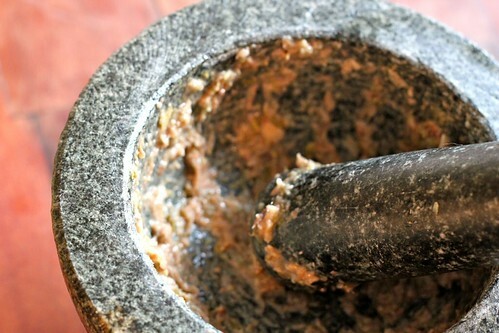 It’s a dynamite sauce that’s so much better when you make it in a mortar and pestle.